Asura (Sanskrit, Pāli: असुर; Tibetan: Lha-ma-yin; Japanese: 阿修羅 Ashura; Korean: 아수라; Chinese: 阿修羅; pinyin: Āxiūluō, Vietnamese: A tu la) in Buddhism is the name of the lowest ranks of the deities or demigods of the Kāmadhātu. 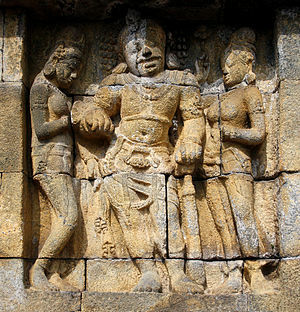 They are described as having three heads with three faces and four to six arms. Asura – a member of a class of divine beings in the Vedic period, which in Indian mythology tend to be evil and in Zoroastrianism are benevolent. Because of their passions, rebirth as an Asura is considered to be one of the four unhappy births (together with rebirth as an animal, apreta, or a being in Naraka). The state of an Asura reflects the mental state of a human being obsessed with ego, force and violence, always looking for an excuse to get into a fight, angry with everyone and unable to maintain calm or solve problems peacefully. Another aura that I sighted from a photo, is the Asura aura, a very distinct demarkation on the subject’s right face! The aura reads as “Gearing for and ready to Fight”! The photo was taken last year, and it seems that the BIG FIGHT occurred after that and still unresolved or no reconciliation henceforth.